Do you love black socks and wish you could get your black sock drawer replenished every month? 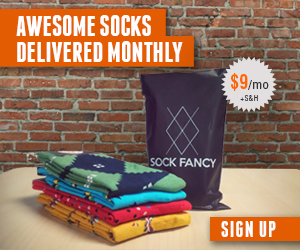 Check out SockRush, which is a subscription service for socks that delivers black socks to your door, each month. You can buy them for yourself or as a gift, choose the frequency, and then set it and forget it! So if you love black socks, it’s time to get started with SockRush! Previous Article SockPanda – awesome socks with a donation component as well!